One of the delights of having children who do their own thing and are willing to share this with you, is that you end up doing things that you would never do had your children not suggested them. So it was that one of our sons introduced us to Peterson’s book (even bought us a copy) and thought it would be a good idea if we all went to hear him speak in Manchester. Our first response was that anyone who thinks you can number the rules for life needs to be considered with caution (although we were informed – not sure if this is true – that Peterson may write a second book with more rules) and secondly, did we really want to fight the terrible Manchester traffic (in the rush hour) to get there? But we did and yes, the traffic was terrible! I’m glad we went. It was an experience. 1700 people were in the audience. I could scarcely believe that, although it’s interesting that none of the UK venues have sold out, although many European venues have, but maybe that’s because of the size of the venue. Also, as Peterson acknowledged, the balance between male and female members of the audience was 60:40. I didn’t see that as a problem. I had wondered before going whether there would be any demonstrations. Peterson seems to be hated as much as he is loved, and at the beginning of the show we were told that heckling would not be tolerated. This was said with ‘tongue in cheek’ and I wondered if it was really an invitation to heckle. But in the event there was no heckling. At one point a young man tried to get on the stage, seemingly to share some information that he had found on his mobile phone about a reference that Peterson had trouble remembering. Needless to say the security guards stopped him, but Peterson was kind in his acknowledgement of the young man’s attempt to help. The event surprised me on a number of levels. According to Wikipedia, Peterson is 56, but he looked a lot older than that. He is extremely thin and grey and to me looked exhausted. Evidently he hadn’t arrived in Manchester until 3.00 am on the day of the presentation and then in the morning had to do a BBC interview and following this visit a Manchester Boxing Club which, by all accounts was turning round disaffected young men. No wonder then that he looked shattered. In the event, he talked mostly about his encounter with the young men from the Boxing Club he had visited in the morning, relating that from time to time to the 12 rules. He talked for an hour without notes (I think there were auto-cues, although he didn’t seem to stand still long enough to read them) and there were times when I felt he wasn’t able to adhere to Rule 10, i.e. I asked myself where was the evidence for what he was saying. But on the whole I found myself sympathising with how exhausted he seemed (whilst at the same time recognising how much money he is making from this tour!) and I didn’t find a lot to argue with in what he said. I don’t have strong feelings for or against Peterson. He is an interesting phenomenon. He is extremely articulate and able to argue his point well (even if he scarcely draws breath and would probably be easier to listen to if he would just pause occasionally), drawing on a wide range of literature, not least Biblical references. What really surprised me was the audience. They gave him a standing ovation and whilst I found him interesting to listen to, his talk was unstructured, difficult to follow and clearly delivered by someone who was exhausted. On this particular night, from my perspective, it did not merit a standing ovation. 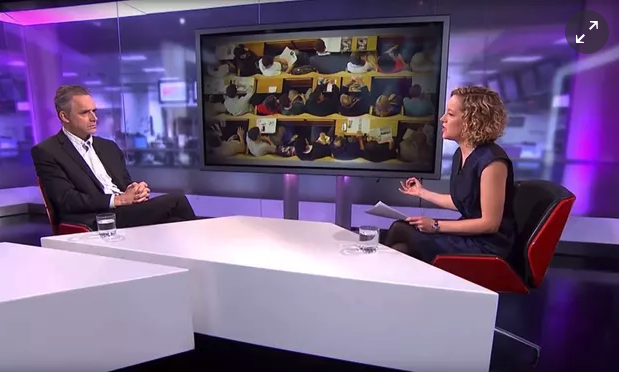 I think a debate might have been more interesting, such as the one with Kathy Newman, as was reported in The Guardian here – https://www.theguardian.com/commentisfree/2018/jan/21/banning-jordan-peterson-causing-offence-cathy-newman-free-speech , but that would probably have required too much energy on such a punishing tour. Next Article E-Learning 3.0 Task 1 completed!